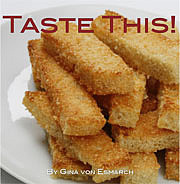 Published on July 2, 2012 in Recipes. 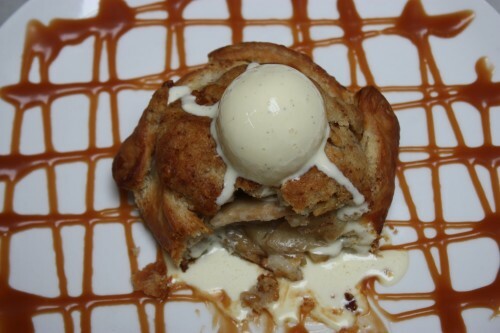 0 Comments Tags: apple galette, Caramel Sauce, Chef Kayci Edwards, cream cheese dough, streusel. 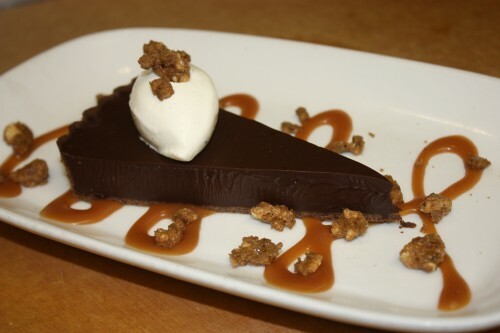 and her decadent Chocolate Tart recipe which garnered rave reviews. To celebrate the return from my blogging hiatus, and show my appreciation for your patience while I was disconnected, I am posting this second coveted recipe of hers. 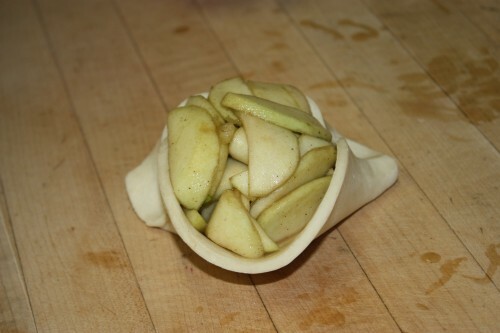 Edward’s Apple Galette is a wonderful variation of the traditional 4th of July Apple Pie. 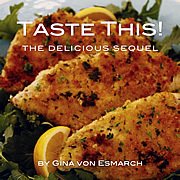 This recipe will inspire your inner gourmet goddess, as each bite is filled with all of those flavors that make your mouth explode! 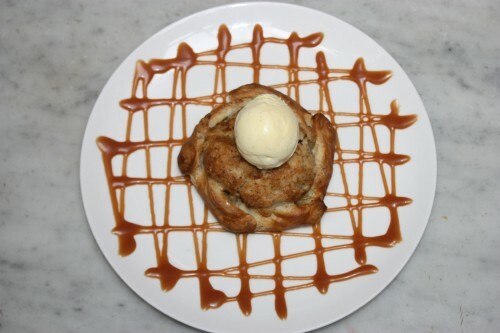 There are a few steps involved but many of them can be done ahead of time such, as the cream cheese dough and caramel sauce. Note: The dough can be made up to a day in advance; let it sit on the counter a few minutes before rolling out. Cream together cream cheese and butter until completely combined. Add flour all at once and mix until just combined. 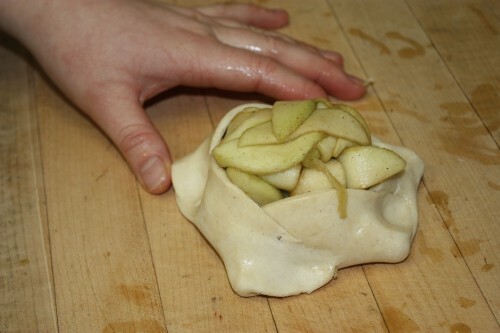 Wrap dough in plastic and let chill before use. Combine all dry ingredients and mix until combined. Cut butter into cubes and add all at once to dried ingredients. Combine until the mixture just starts to come together, it will look crumbly. Butter pieces should hardly be visible. Do not over mix – it will result in a bowl of dough! Combine sugar, corn syrup and water in a sauce pan and bring to a boil. Cook until mixture reaches a medium amber color. When it’s the desired color, stop the cooking process by adding the cold heavy cream. USE CAUTION the sugar will boil and spit up as you add the cream so use a whisk with a long handle. If some of the caramel seizes, turn the heat on low and whisk slowly until the caramel is smooth. 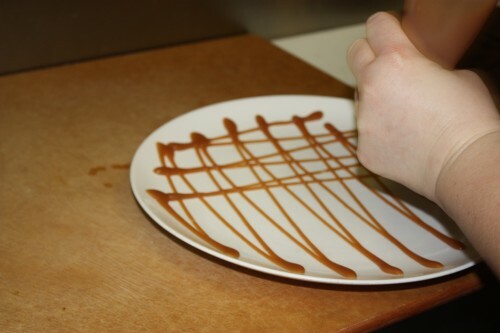 Note: To make a decorative plate design similar to Edward’s, transfer cooled caramel into a squeeze bottle and decorate your plate; alternatively the sauce can be added around the plate. 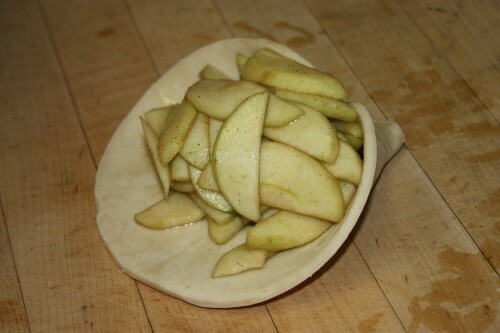 It is important to taste this recipe along the way to find that optimum balance between the sweetness of the ingredients and tartness of the fruit. 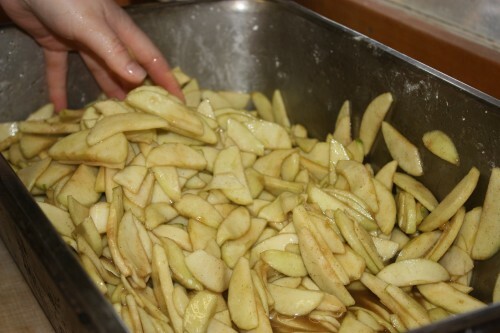 Combine all ingredients and let sit until all the sugar liquefies, stir occasionally. 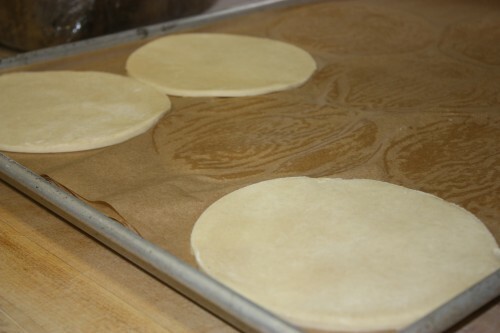 Once the dough has chilled, place it on a lightly floured surface and, using a floured rolling pin, roll it into a 6-inch circle (about 1/4 inch thick). 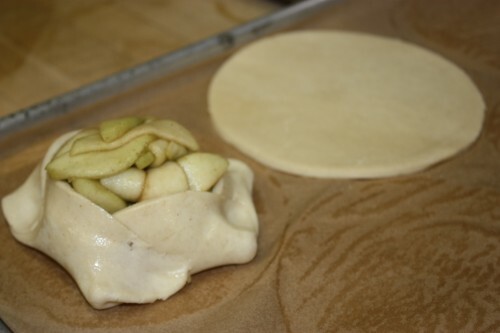 Transfer to a parchment-lined baking sheet. 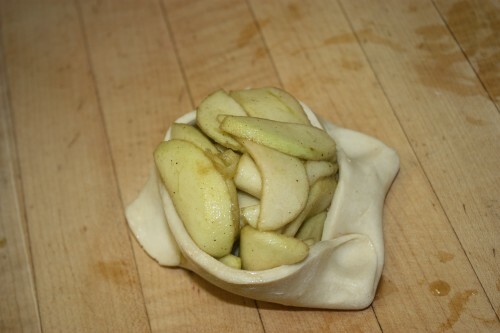 Add 3/4 of a cup of apple filling into the center of the dough, leaving a 1-inch border. 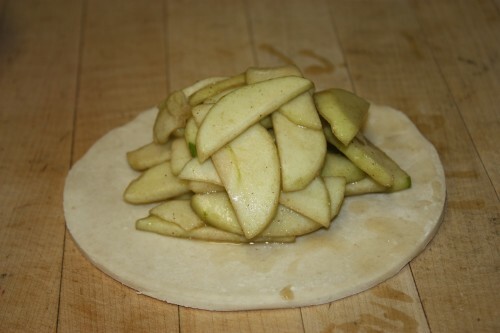 Fold the edges of the dough over the apples filling and pleat the dough as you go. Bring the first piece down and as your bringing the top piece, pressing firmly so it stays folded. When assembled there should be five folks and five sides. Galettes will cook for 30-40 minutes. To test for readiness, it is important that it can be lifted up with a spatula. 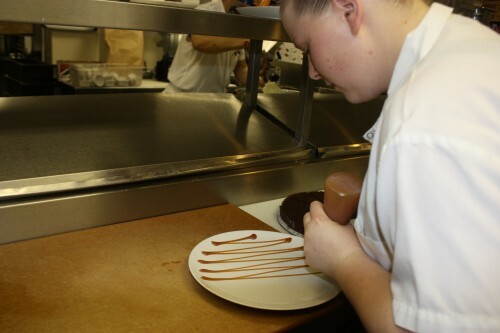 Once the bottom is golden brown color and top is bubbling, the dessert is ready to enjoy! For that extra flavorful experience, be sure to add a dollop of vanilla bean ice cream. 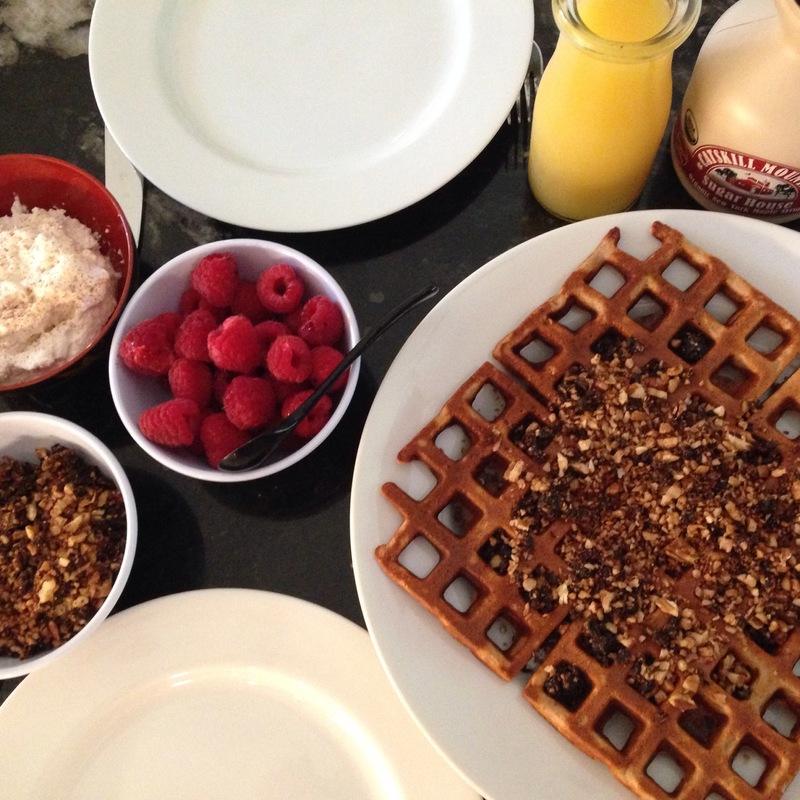 These individual serving galettes are best served warm. 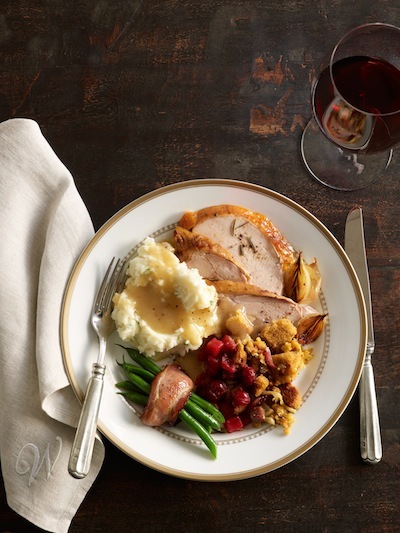 To reheat, place in a pre-heated 350°F oven for 10 minutes.